Back in 1910 plant hunter E H Wilson was lucky enough to discover this plant at Moupin, western Sichuan and introduce it to the west. Goodness knows what happened to it from there because it was not until 1991 that it was reintroduced and we were able to secure seed. Growth has been slow, but this interesting, worthwhile plant was worth the wait, don’t you agree? We now have a number of flowering size plants living happily in EVRG’s version of Sichuan. R. thayerianum grows into a rounded shrub with thick stiff leathery lanceolate leaves with margins recurved. The underside is covered with fawn indumentum. However the new growth, as you can see, is covered in silvery hairs. Because the leaves can be held on the plant for a number of years it makes a nice dense shrub. The campanulate shaped flowers can be white, white tinged pink or white flushed pink on the outside of the lobes, there are no blotches, nectar pouches and very few spots inside the corolla. 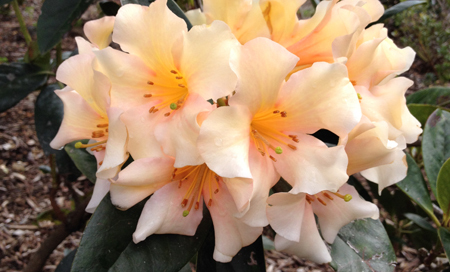 If you wish to locate this interesting rhododendron in the garden, take the path marked Sichuan off Noel Sullivan walk, continue along this path until you meet yet another path and look left. Enjoy tracking it down.